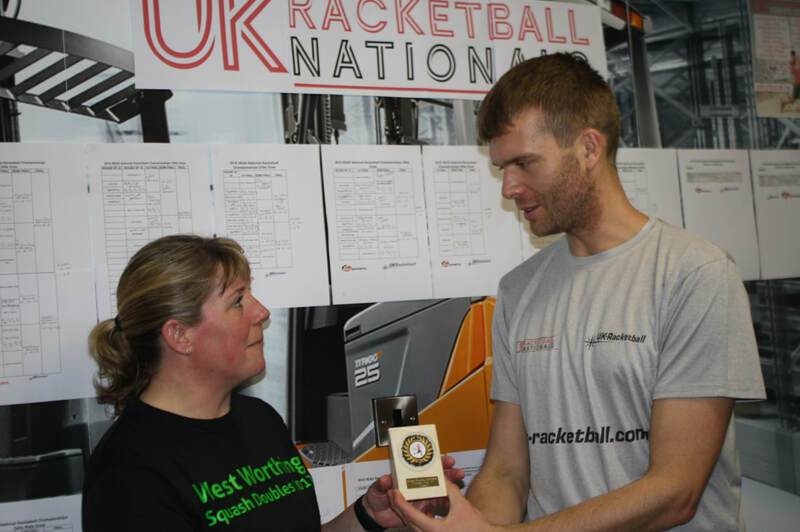 The National Racketball Championships took place last weekend at Nottingham Squash Club. With almost 150 entrants across 15 grades it was a fantastic couple of days filled with competitive Racketball. Many old faces had to fight hard to retain titles with many players new to the competition eyeing up and then taking titles of their own. The Open’s both went heavily the way of seeding with Tim Vail claiming his 10th title in the Men’s and Natalie Lawrence taking her 3rd in the Women’s. Both players did not drop a game all weekend. Vail comfortably saw off the challenge posed first from Eliot Selby and then Mark Fuller. Lawrence defeated fellow Devon and Exeter player Caroline Wright in the final. In the first of the age group categories David Gouldby who made the final in 2017 managed one better this year by first defeating Adam Tyson and then ¾ seed James Powley in the group stages and then overcoming Colin Griggs in the final. Natalie Lawrence almost became the first woman to play in the open Over 35’s final after defeating Richard Cobb in her opening round before being narrowly defeated 2-1 by Colin Griggs in the group decider. The Men’s Over 40’s was always looking like it would be a competitive event and on the day it did not disappoint. Karl Mullins had a great run in the top half defeating 5/8 seed Spencer Harris and then ¾ seed Craig Bartlett. In the semi final Mullins did not have enough to make it past last years champion and no.1 seed Richard Davies but came close to taking the match to 4. In the bottom half 2 seed Adam Grilli survived a 5 game thriller against Phillip Hall but in a repeat of last years semi final did not have enough to overcome Davies in a match that finished with a similar score line. In the Women’s Over 40’s Caroline Wright defeated both Sue Smith and Nur Jones to set up a deciding match against Clare Young. In one of the tightest events of the day Young came through with a 3-2 victory to claim her first title. Nina Parker started well in the women’s over 45’s with victories over Tanya Ruff and Sue Smith but Siobhan Garland proved too strong in the final game of the group winning 3-1. The men’s over 45’s saw James Powley take his first National Title since 2012 when he won the Over 40’s. In the semi finals he defeated retaining champion no.1 seed Jason Russel 3-1 in one of the longest contests of the day. This set up a final against the 2 seed and last years losing finalist Mark Francis. Unfortunately for Francis he was to become a defeated finalist for two years in a row after another close contest 11/9, 9/11, 11/5, 11/6. Predictably the Men’s Over 50’s was the largest draw of the day. In the top half No.1 seed Neil Baldwin made it through his first few games of the weekend without a scare. In the semi’s Michael Wardle took the first game 11/8 but ran out of legs to complete the upset with Baldwin moving him expertly around the court. In the bottom half 5/8 seed Matthew Theodoris caused an early upset with a 3-0 victory over Dan Fernandez in the quarterfinals. Victory over Adrian Murphy who was forced to retire due to injury set up the much-anticipated final against Neil Baldwin. The first was tight with Theodoris taking the first 11/7 but after a strong start by Theodoris in the 2nd it was all over 11/4, 11/5 and a first title for Theodoris after a great exhibition of Racketball. The women’s 50’s and 55’s followed a similar pattern and familiar pattern with Lesley Sturgess replicating her success in both events the year before. In the Over 50’s Nina Parker took a game before being eventually defeated 3-1. In the 55’s Carolyn Lindsay won the 4th game convincingly to set up a decider but in the end the determination and consistency of Sturgess’s play proved too much as she ran away with a comfortable 5th. John Cordeaux was victorious in the men’s Over 55’s for the 3rd year running. He defeated two times champion Mike Phillips in the semi final before going on to defeat UK-Racketball Series regular and Over 45’s Nationals winner Paul Haigh in the final. Cordeaux was exceptional throughout the event, not dropping a game or even having a tie break. In the 2017 UK-Racketball Series Stephen Widdison ruled supreme closing the Series out with 5 titles and a 19 match unbeaten run. At the Nationals he extended this to 22 matches with victories over Alan Susskind in the quarters and Trevor Bush in the semi finals 3-0. The final of the over 60’s was the last match of the day and turned into a long push for both competitors. Widdison was up against Graham Holmes who had defeated the two seed Chris Hawken in quarters. In the end his determination and momentum carried Widdison through to take his first title 3-1. The women’s over 65’s was a three way group. Rosie Connell had won the Over 60s in 2016. Gloria Saunders had 4 titles to her name including the Over 65s in 2012 and Bet Dryhurst had won 30 titles including the over 65’s in 2014 and the over 70’s in 2017. On the day the grade that was the smallest in entries but the largest in terms of existing titles was won by Rosie Connell with Bett Dryhurst picking up second place. Last years over 65s champion Graham Greensall retained his crown. The whole event went to seeing with both ¾ seeds meeting the 1 and 2 seeds in the semi finals. Greensall overcame David Mudge in the top half 3-0 with Phillip Clark doing the same in the bottom half to David Browne. The final ended up following the same pattern with top seed Greensall overcoming Clarke 3-0 making it two titles in two years. The senior draw of the day was the Men’s Over 70’s and its competitiveness did not disappoint. Both ¾ seeds John Alderson and Hans Bilson had 5 set matches to make it through the quarterfinals. Both struggled to back these tough matches up in the semi finals. Alderson was defeated by top seed Astbury while Bilson despite a promising start could not hold on against Welton. With both top seeds entering the final relatively fresh it was always going to be a good match. Welton struck first 12/10 only for Astbury to come back 11/9, 11/9. The 4th went Weltons way as he leveled the score 2-0 before the tide once again turning in the 5th the way of Astbury 11/5.